In case you have multiple computers at your Home or Office, you can setup all these computers to share a common Wireless or Network Printer. 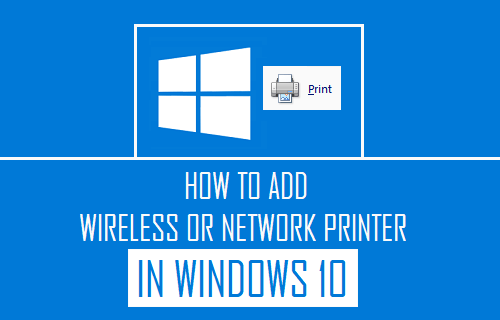 Let us take a look at how to Add Wireless or Network Printer in Windows 10. In general, the procedure to Add Network or Wireless Printers in Windows 10 involves the following two steps. Setup Printer and connect it to WiFi Network. 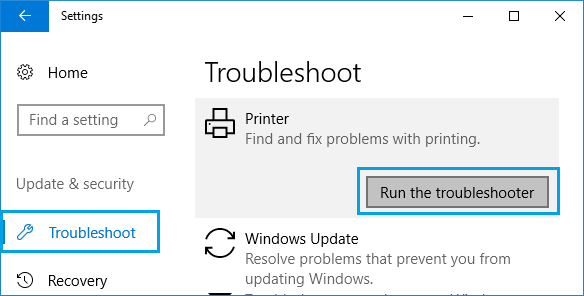 If this does not work, Windows 10 provides other methods to Add printers and also allows you to Run the Troubleshooter to find and fix problems with printers on your computer. Most Wireless Printers come with a LCD screen which allows you to go through the initial setup process and connect to WiFi Network. On most printers, you will be required to follow these steps. 1. Switch ON the Printer using its Power button. 2. Access Setup Menu on the LCD Panel of the printer. 3. Choose Language, Country, Install Cartridges and Choose your WiFi Network. 4. Enter your WiFi Network Password. In case your printer does not have a LCD screen, you will have to connect the printer to the computer, in order to complete the setup process and connect to WiFi Network. Once the Printer is connected to WiFi Network, you should be able to connect to it from your computer by following these steps. 1. Click on Windows Start button and then click on the Settings icon. 2. 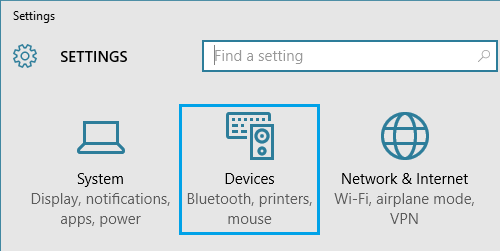 On the Settings screen, click on Devices option. 3. On the next screen, click on Printers & Scanners in the left pane and then click on Add a Printer or Scanner option in the right pane. 4. 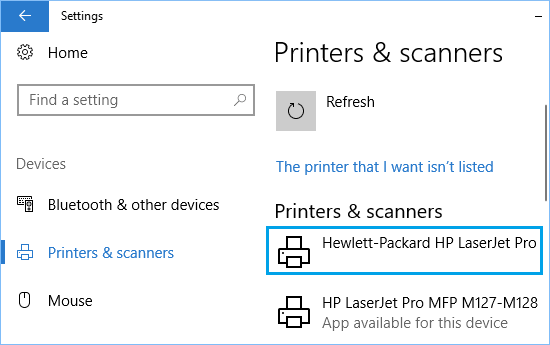 Windows will now start searching for Printers and list the available printers under Printers & Scanners section. Simple, click on your printer as it comes up in the list of Printers. 5. Next, click on the Manage option (See image below). 6. On the next screen, you will see the option to Print a Test Page and confirm that your computer is connected to the computer. From the same screen, you can manage printing preferences and Run the Troubleshooter, in case you are having problems connecting to the printer. This is the simplest way to add a printer in Windows 10 and should work for most new models of printers. 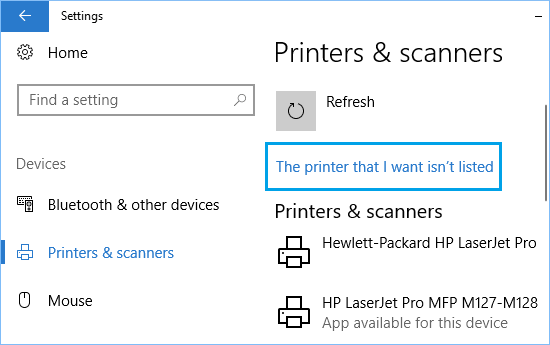 You can move to the next step, in case Windows 10 is unable to list your printer. 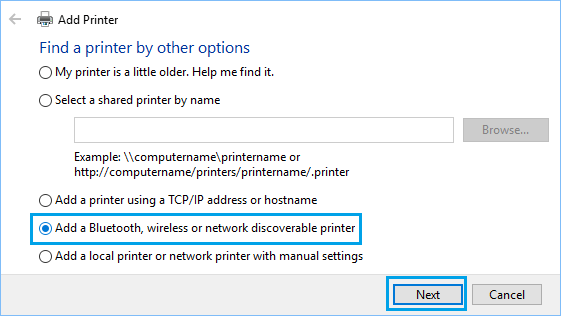 Follow the steps below, in case Windows 10 is unable to list the printer that you wanted to add. 1. Open the Devices screen, by clicking on Start button > Settings > Devices. 2. On the next screen, click on Printers & Scanners in the left pane and then click on Add a Printer or Scanner option in the right pane. 3. Allow Windows to start searching for Printers and then click on The Printer that I want isn’t listed. 4. On the next screen, you will see various other options to find your printer as described below. 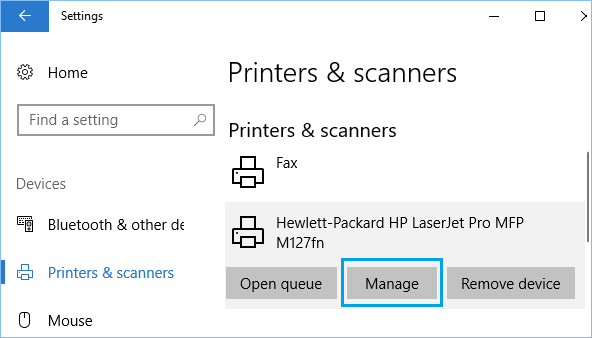 My Printer is a Little Older – You can start with this option and Windows 10 will start a deeper scan using different methods to detect different types of computers. Select a Shared Printer by Name – This option is usually helpful in work environments, where you can go ahead and enter the full path to the printer as provided by your network administrator. Add a Printer Using TCP/IP Address – This requires you to know the IP Address of your printer. Add a Bluetooth, Wireless or Network Discoverable printer – This is the same option that you have already tried when you clicked on Add Printer option. Choosing this option performs another scan to find your printer. Add a Local Printer or Network Printer with manual settings – This option is useful in case you have a printer that uses a serial or parallel port (LPT1, LPT2 …). If none of the above options work, you will need to run the troubleshooter to find and fix problems with printing on your computer. 1. Open Settings by clicking on Start > Settings Icon. 2. On the Settings screen, click on Update & Security option. 3. 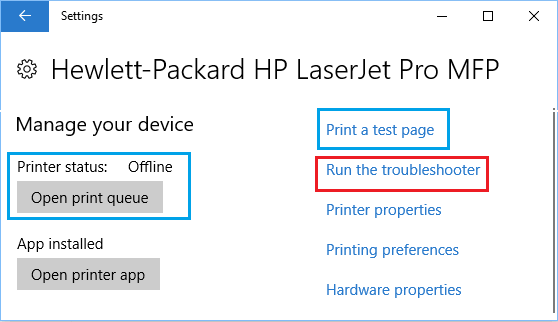 On the next screen, click on Troubleshoot in the left pane and then click on Printer > Run the Troubleshooter in the right pane. 4. Next, follow the online instructions as Windows tries to find and fix problems with printers on your computer. In addition to this, you can also refer to Windows support page as setup by Microsoft to fix printer problems.